You are looking at the newest edition of the Audi S8, a top-of-the line S-badged A8 powered by a twin-turbocharged 4.0 liter V8 claiming the number one position in the market of über-limos and ultra-comfortable power sedans. Audi offered us a weekend of S8 pleasure surrounded by the ultimate comfort, refinement and high-tech multimedia currently available in the German stable. For its first two generations, the S8 was an executive touring car. The new two-tonne model offers a similar feeling, but also a hell of lot more. The 2012 S8 has made a giant leap from its predecessor and is capable of delivering more power, speed, refinement and agility with less fuel consumption and noise levels. 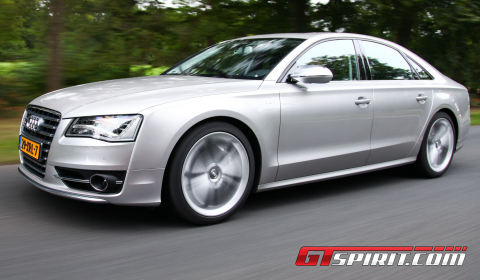 The new 2012 Audi S8 did not offer us the very first taste of Audi’s new V8 engine, which also powers the S6 and S7. We drove both S-models earlier this year and experienced the excellence of the smooth power plant featuring Audi’s “cylinder on demand” technology used under part load for a lower fuel consumption. It simply means that electronics shut down cylinders 2-3-5-8, while cruising and using light throttle responses. The system works unnoticed. The power offered from the engine dishes out its 520hp at 6,000rpm and 650Nm between 1,700 and 5,500rpm to all four wheels. That’s enough power to slingshot you from 0-100km/h in 4.2 seconds – quicker than the rivals from Jaguar and Mercedes. The top speed is electronically limited at 250km/h. Excellent numbers, but those are only memorized after a full experience behind the steering wheel. The acceleration after pushing the throttle and the initial pause while the gearbox shifts down creates a responsiveness and acceleration no one has never seen before in any S8. It is exhilarating! The active engine mounts and noise cancellation with four microphones inside the cabin allow the S8 to do its catapulting task in relative silence. The engine steps off the line gracefully and spins smoothly to the redline without the slightest hint of turbo lag. A self-locking center differential, limited-slip rear differential with torque vectoring and an eight-speed automatic let the drive train stand out from direct competitors. The muffled growl from the quad end pipes under full throttle, smooth and deep, accompanies the grandeur of the twin-turbo V8. The handling and ride quality fits the S8 in an excellent manner. The luxury power sedan is capable of eating stretches of highway with ease while accessing loads of comfort, even on the optional 21 inch five-spoke wheels fitted to our tester. Cornering is not the S8’s favorite habit due to the car’s considerable weight and size. The steering has a little shortage of self-centering action, but this seems to be part of any current Audi S-package. The S6 and S7 had the same! Still it delivers accurate steering, excellent body control, and supreme stability. Inside the cabin, there is loads of refinement and an impressive list of high-tech gimmicks, like a MMI infotainment system with a pop-up, eight-inch display, in-car wireless internet, and Google Maps imagery. You also have a 1,400 watts Bang & Olufsen surround sound audio system, speech recognition, a night view camera with pedestrian recognition and all-around camera view system. The equipment list is as impressive as you’d expect from a top-of-the-range limo. The excellent interior features leather, visible carbon fiber and aluminum trim standard on the dash and doors, although wood can be specified in place of the carbon. The 22-way adjustable leather sport seats offer massage capability, cooling and heating (massage and heating also in the back). The rear passengers have electric blinds for the rear windows and a central console offering access to their own multimedia and/or climate control system. Upon request Audi installs a cool box for your everyday refreshment. The Germans have built a brilliant luxury sedan. The combination between refinement, luxury, comfort, technological highlights and that V8 engine are a sheer example of how good Audi’s can be! The 2012 model series is the benchmark in a market of powerful, comfortable super sedans capable of transporting the driver and his passengers in the most brilliant way possible. Yes, the Audi S8 should have had a bit more intensity and driver involvement, but the S6 and S7 aren’t any different on this subject. This is what you get from the Germans headquartered in Ingolstadt. So did we like it? Personally we think that the S8 has enough driver involvement to call it excellent, technical enhancements to call it stunning and an engine performance which is exhilarating. This car has definitely entered our personal wish list and has become one of our 2012 review highlights!